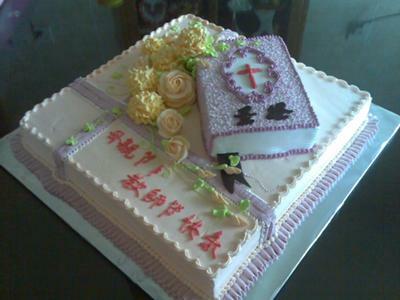 I have made this cake for my church, Sunday School to celebrate our Teachers' Day & Mothers' Day. I baked a 14" and 8" square chocolate sponge cake for the base and the Bible. I designed the Bible resting on a gift with a bouquet of roses and carnation by the side. I hope you all like it. are a great cake decorator.